Do you remember those Choose-Your-Own-Adventure books you had as a child? The ones where if you wanted your hero to fight the dragon, you should turn to page eight, but if you preferred her to choose the better part of valour and retreat to come up with a cunning plan, then you should head straight for page thirty-four. All of the building blocks were there; you just had to decide how to put them all together to come up with what you hoped would be a sensible plot. I have stumbled upon the Choose-Your-Own-Adventure pizza as the perfect way to cater a party. Of course, I cannot lay claim to the invention of choosing toppings for pizza any more than I can, or would, the adventure books. Children’s cafés have been doing this for years. What I didn’t foresee was what a low stress way it would be to feed adults too, nor how much fun they would have doing it either. Normally, I am rushing about at dinner parties, because I make a lot of food, often that has to be prepared at once. I am not one of these people who comes up with dishes that can be prepared in advance. 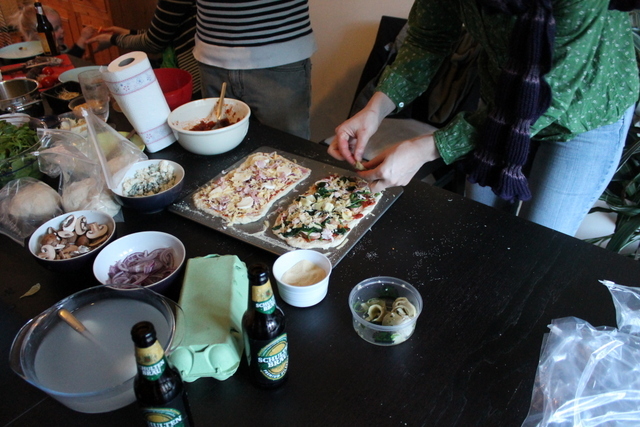 If you are like me, the Choose-Your-Own-Adventure pizza party is a great way to allow you to relax. Everything was made in good time for the guests to arrive, or sliced, as appropriate, and laid out on the dining room table so people could choose what to put on it. 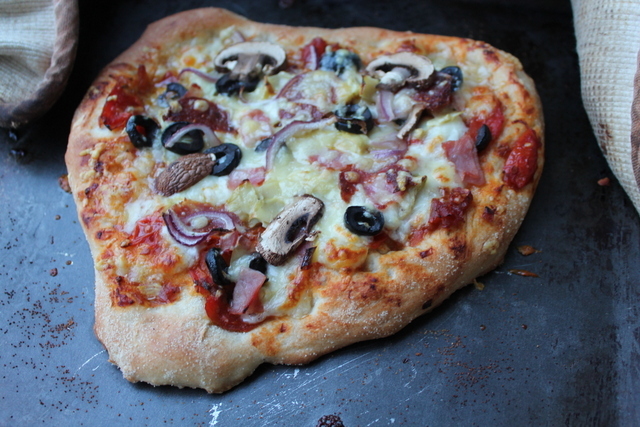 Of course, because it was me, I had made most of the components, including the mozzarella, and the smoked mozzarella, as well as the dough, and the pizza sauce. I didn’t make the charcuterie, though, maybe that is for another pizza party another time. But in general, it was pretty relaxed, with no fancy elements to put on, or to be pureeing as the guests arrived. I also split the dough into individual portions, and placed them ready and waiting for the final proving inside a ziploc bag. All in all, it was a success, low stress, meant I got time with my guests to have fun, and they got time to make the pizza of their choice. 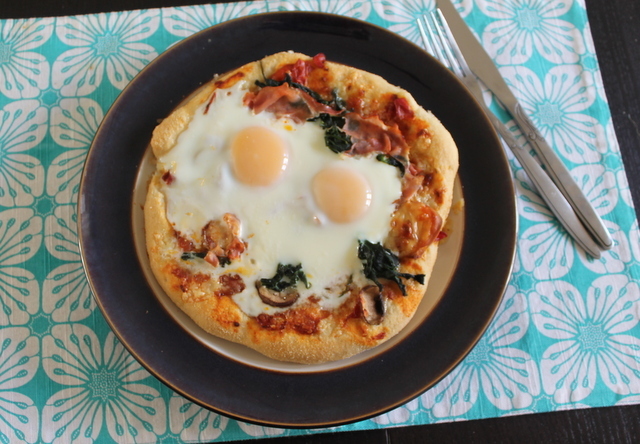 We even had two servings of dough and just enough pizza sauce leftover the next day to make the perfect hangover breakfast, with bacon, sausage, mushroom, spinach and the egg. The dough kept well in the fridge, and should freeze well too. 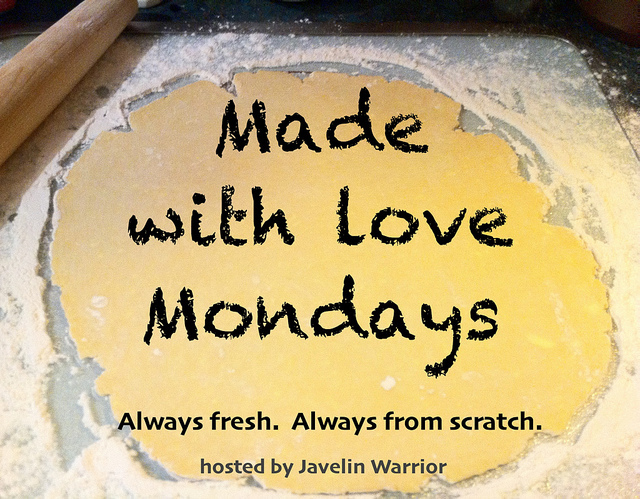 And, because I made all of the elements of the pizzas, and my friends loved to make their own, I’ve decided to enter them into this week’s Made with Love Monday hosted by Mark of Javelin Warrior. Of course, it will also appear in the round-up post for this month’s Cheese, Please! because I used the fresh cheeses that I made, and the dough had the whey from the cheese in it. The amounts given below is enough for 4 individual pizzas. I made enough for 20, but I’ve scaled it down here. On the morning of your party, make the mozzarella, and bodge up a smoker to smoke about half (or buy both, I won’t judge). 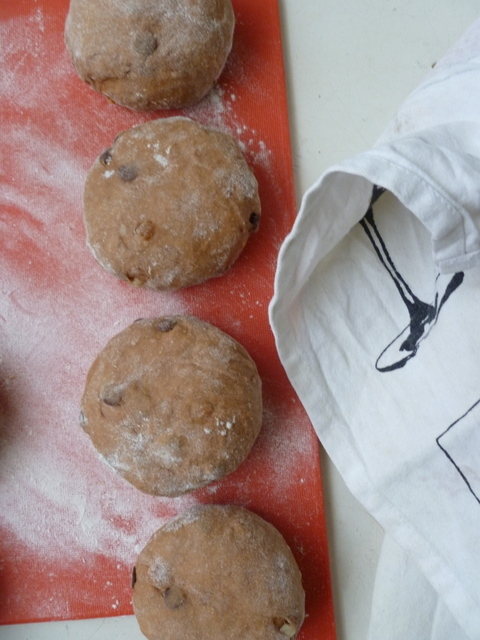 Make up the dough, according to the recipe I’ve linked to – or use another favourite of yours. Allow to prove for 90 minutes. You can totally relax or eat lunch, or do whatever you like for a bit at this point – most unusual for getting ready to host a crowd. At some point chop up and lay out your toppings, in a very leisurely fashion. You even have time to decide you should offer pineapple after all, and run out to get some. It’s up to you. Fold over the dough, as Dan shows you in the recipe I linked to. Leave it to sit for another half an hour. Treat yourself to a cup of tea – or something stronger if you prefer. Divide the dough into your ziploc bags, and place them on the table with the rest of your toppings. Then you need to make up your sauce. In a frying pan, so that you can get a lot of evaporation, soften the red onion. Add the garlic and cook off until the scent hits you. Splash a good helping of red wine into the pan and cook until it has almost evaporated. Finally, add the tomatoes and oregano. Cover the pan with a lid for about five minutes, until the tomatoes breakdown a little. Remove the lid and cook on a medium heat, until the sauce is really thick. Put this in a large bowl on the centre of the table. Serve up the mozzarella, and open the smoker, hoping you still have resplendent balls, and not smoky little discs, unlike mine. Even if they are, use them anyway. Stand back and watch the children show the adults how to get stuck into the shaping and topping of their pizzas, closely followed by the adults trying to top one another’s efforts. I come from a fairly stoical family, who are not big on physical affection. We prefer friendly pats on the back to full-blown hugs. When I got my A Level results, my Mum had to tell my Dad to give me a hug to show he was proud of me. I knew anyway, and he knew that I knew; but we hugged for my Mum’s sake, and it was awkward. That hug has stuck with me for 20 years, so it just goes to show that it was a Momentous Occasion. We show love through our merciless mickey-taking – and long may it continue! It will come as no surprise whatsoever to you then, when I confess that I do not have a romantic bone in my body (and whenever I have spare bones hanging about, I tend to make stock from them, so even if I had, it wouldn’t have lasted that long). Cut flowers and chocolates will not woo me (although edible seeds and chocolate as an ingredient would win my heart in a flash). George, from the Famous Five, was more my style than Cinderella, or Sleeping Beauty. I have never dreamed of fairytale weddings, or handsome princes. My dreams were more likely to feature horses and hansom cabs! The Big Guy and I have never celebrated Valentine’s Day. I think he would love to be a bit more romantic on a more consistent basis, but I don’t like all that soppy stuff. So, in light of this information, you may surprised to find a Valentine’s post on Edible Things. Not to worry, I am not being inconsistent. We have an organisation-wide meeting on today, and the HR department thought it would be a good excuse to have a bit of a celebration, so they asked us all to show our colleagues some love for Valentine’s, by making each other some fair food. This set me off in a bit of a panic; if I can’t see what is romantic about a meal for the Big Guy, how was I ever going to come up with something original and interesting for my workmates? So, I turned to Facebook (whilst love may make me queasy, I’m always happy for people to show their likes…) to ask folks over there what they thought. 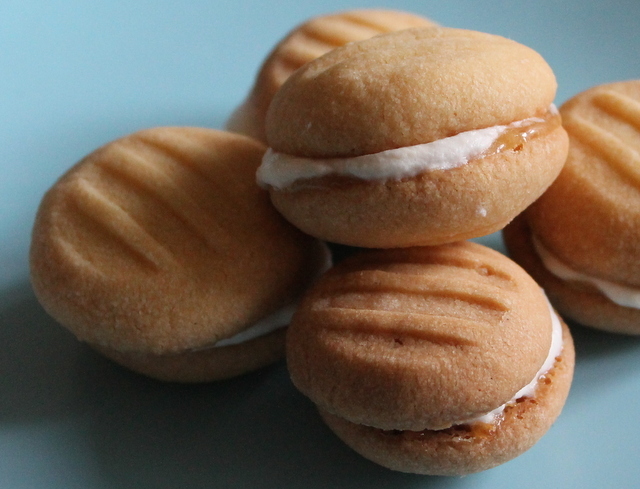 I got some great suggestions but when Emma mentioned melting moments, with a passion fruit filling, I knew this was the perfect thing to serve up. 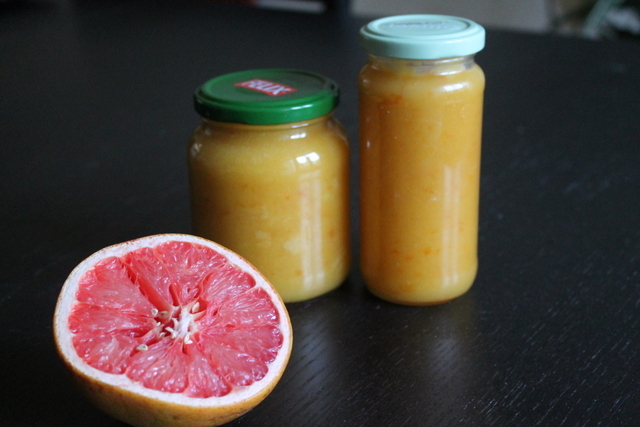 And that I was going to make and blog about passion fruit curd. To me, this is the king of the fruit curds, tart and sweet. Unfortunately, no passion fruits were to be found, so I settled for the next best thing; ruby grapefruit. Once citrus is well cooked, most of it will go orange, so don’t be disappointed to find that you haven’t got a ruby coloured curd. The curd needs to have time to cool before you use it in the filling, so you should make it the day before you bake the biscuits. These easy and delicious treats look, and taste impressive. When all’s said and done, what better way to show your colleagues that you are fond of them? Making the curd isn’t hard, but does require patience. Firstly, sterilise your jars, by washing in hot water and placing in a low oven, or by running them and the lids through a hot cycle on the dishwasher. You can seal curd with cellophane, but if you use lids, these will need to be boiled as the curd is approaching doneness. There are two methods for cooking curd – direct and indirect heat. The direct method is quicker, but there is a greater risk of the egg scrambling. Sometimes, with very vigorous whisking off the heat, you can save it, as long as you notice as soon as it starts to curdle. The indirect method runs much lower risk of splitting, but it does take a lot more time. If you want to use indirect heat, you will need to cook the mixture in a double boiler, making sure the water at the bottom does not touch the bottom of the bowl, and check it occasionally to make sure the water has not evaporated. Whichever method you choose, combine the grapefruit zest and juice, butter and sugar, and heat gently, until all of the butter has melted. 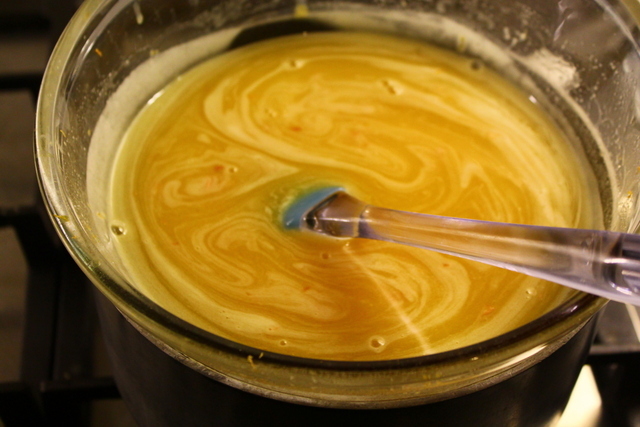 Over a low heat, slowly add the egg to the buttery mixture, whisking vigourously as you go. When all of the egg is combined, increase the heat to medium, and stir until the mixture is thick and creamy. This could take a while, so settle in with a good book, but make sure you don’t allow the curd to catch on the bottom, and remember to scrape down the sides too. Once the pouring consistency reaches thick ribbons, put it in the hot jars, and fill to 3 mm from the top. Cover with a wax disc, and seal immediately. The curd will last up to 4 weeks. Once opened, store in the fridge. 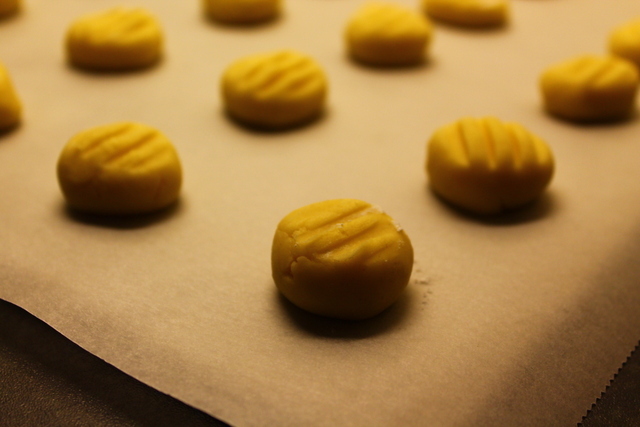 To make the melting moments, preheat the oven to 160°C, and line two cookie sheets with baking paper. Beat the butter until pale and fluffy. Add the flour, icing sugar and custard powder, and mix well. This is a pretty dry mix, but it should all come together. There is no need to bother with seiving the dry ingredients. Not as Flat as a Pancake! 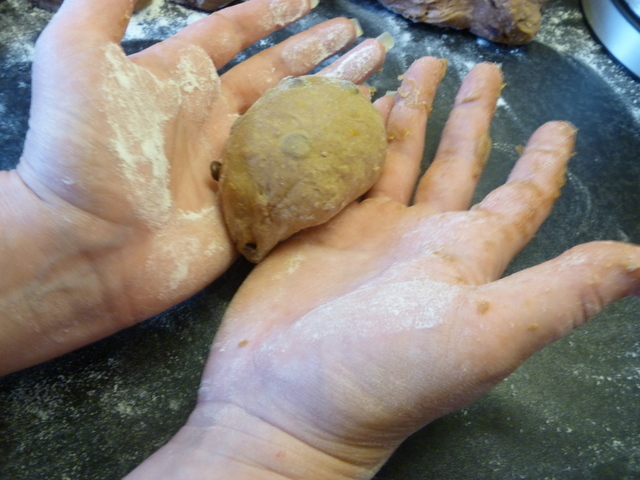 Roll small lumps of the dough into balls. This amount of dough should give you about 26 biscuits. Place them on the cookie sheets, then flatten them with the back of a fork, which you should dust occasionally with icing sugar. Bake them for 15-20 minutes, until crisp. Be aware that these biscuits should come out of the oven pale, as they will continue to cook, and colour more while cooling. Allow to cool. Whip up the cream until it is pretty stiff, and stir through 3 tbsp of the curd. You can leave it as swirls through the cream, if you want. Place a little curd on the base of a biscuit, add a tiny dollop of the cream (or you will lose it out of the sides) and sandwich it together with a second. Sit back, and enjoy a melting moment. In theory, these should last a couple of days in an airtight container, but I’ve not yet been able to test this theory. I love trying food from different cultures, especially as a different take on Christmas food, such as our Aussie Christmas dinner. I guess that by now, Swedish food isn’t so different for me, but I thought I’d share a favourite recipe of mine. Anyway, back to the julbord; it groans under a ham, which for me this year was a wild boar one, because the out-laws know I don’t like to eat factory farmed meat; various kinds of inglagd sill ; cold cuts; sausages; lutfisk; spare ribs; and Janssons Frestelse. In my family, we also often have gravad lax. 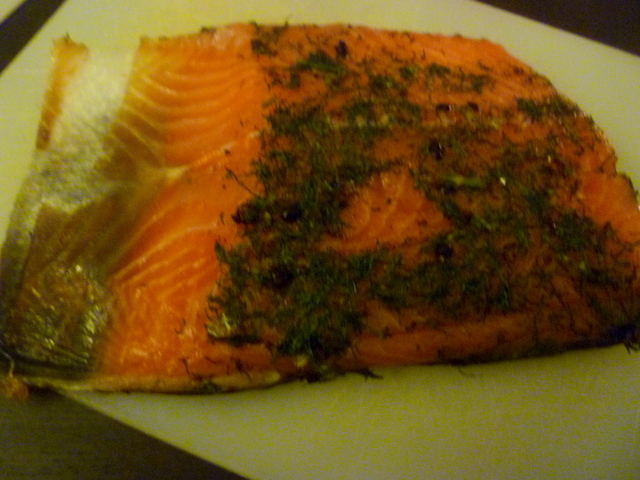 Also known as gravlax, gravlaks, graavilohi, or graflax depending on where you are in Scandinavia. In any country, it means buried salmon. In times before refrigeration, especially in northern European countries where snow covered the ground for a good part of the year, curing and burying meat was a great way to preserve it. Originally, people would use spruce or pine needles in the cure, but the balance needs to be perfect if your fish is not to end up tasting of a certain kind of disinfectant. These days, everyone can make this easy recipe; you don’t even need a spade! In fact, you still have time to make it in time for a new year’s gathering, if you are having one. It looks impressive, for relatively little effort, and it is a big hit. One thing I must urge you is to source your fish well. The increase in popularity of salmon in the last decade or so is concurrent with fish farming, most of which causes horrible environmental damage, due to over feeding and routine, excessive use of antibiotics. At the same time wild stocks are seriously dwindling, due to overfishing, ocean acidification and habitat destruction. 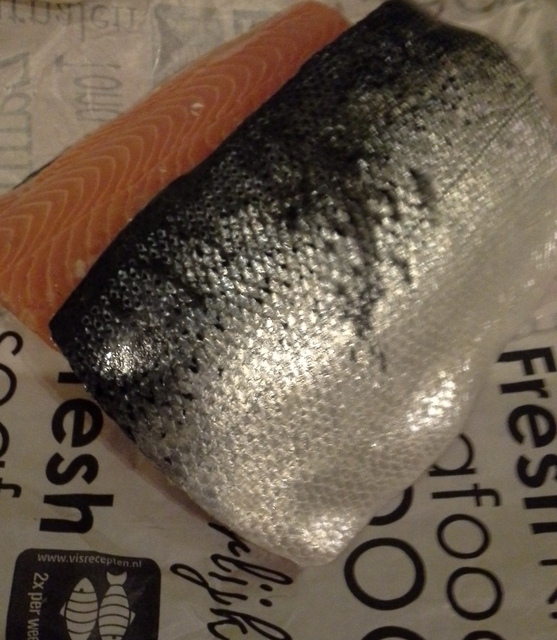 In my opinion, salmon should be a treat, eaten very occasionally, so that we can afford to eat the best organically farmed salmon we can, meaning there is no unnecessary antibiotic use, and better care is taken to ensure that the fish are not over fed. This cure also works well for other types of fish, so you could still enjoy the recipe with cheap and plentiful fish, such as mackerel, or herring, so do feel free to experiment. I made this amount of salmon for a large party, so you can also reduce the amounts of fish you use, but you must have enough cure to really cover the fish, so make a little more of that than you think you might need for the amount of fish that you have. Mix together the salt and sugar until really well combined. Remove the stalks from the dill and chop the rest finely. Mix into the cure with the juniper berries. 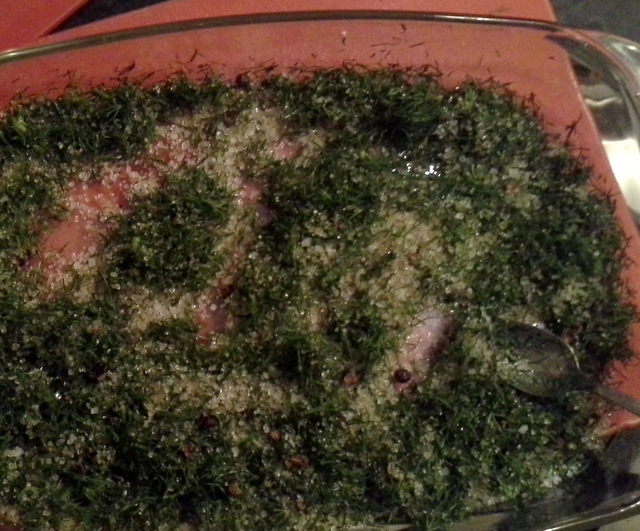 The cure needs to look pretty green and herby, because you want to get a lot of flavour in there. In a shallow dish, get some cling film or a cheesecloth, and coat with about a quarter of the cure. Press one half of the fish down well into the cure, skin side down. Rub the cure into the skin, and leave skin side down on the wrapping. Then you need to load the flesh with the cure. Do this by brushing the flesh with half the brandy and laying about another quarter of the cure over the flesh. Lay a few bay leaves over the fish. Repeat the brandy and cure on the flesh of the second fillet. Once it is well covered, then lay it on the first fillet, so they are flesh to flesh. If the cure falls out, tuck it back between the fillets. Rub the last of the cure into the skin of the second fillet. Wrap the fillets tightly together. If you are using cheesecloth, bind it with a series of butcher’s knots, as tight as you can get. The fish will lose liquid as it cures, so it is best to keep it in the shallow dish, unless you really like cleaning the contents of your fridge. Weigh down the fish, by piling a load of tins on top of a baking sheet on top of the fillets, and placing the whole lot into the fridge. Leave it to cure for 3 days, turning once each day. Rinse off and pat dry with kitchen towel before serving. 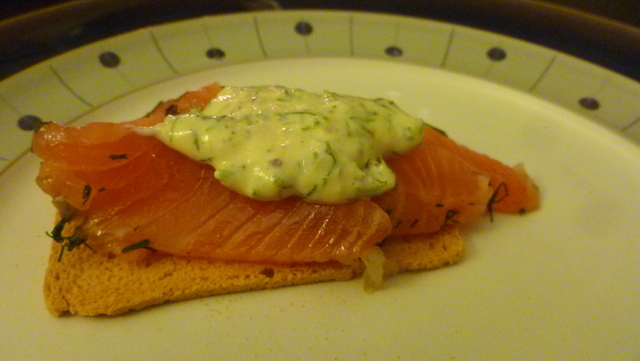 To make the sauce, simply mix together the crème fraîche, dill, mustard and the honey. Season to taste. Serve with the thinly sliced gravad lax on bread, melba toast or knäckebröd, as a delicious starter or hors d’oeuvre. Well, It’s been a long time since I fired up the old blog. I haven’t gone away, but things have changed a little. Not least, WordPress have been messing about with the software, and the photos upload differently, so sorry if they look a little bit weird, until I can get used to the new way. Anyway, since I posted last I had a bit of computer trouble, so I know that I may owe a few of you e-mails, and I have some catching up to do for Seedy Penpals. I also have a little news, that is probably exciting for me, and not for many others, but I’m going to tell you anyway. After a lot of deliberation, I decided to take a role as the Campaign Manager for the Land of Promise Campaign to get better working conditions and the use of fewer pesticides in the pineapple industry in the Philippines, and three weeks ago I signed a contract with Fairfood International. I am excited because it is combining my skills of campaigning, and food, and I’m helping Fairfood plan and deliver a new campaigning strategy. I have dived right in, with planning for the campaign, which has taken all of my head space, but now I have done the background reading, I am hoping to get back to blogging regularly. It does mean that I need to settle into a different posting pattern, but for the time being I have a bit of a backlog of posts to catch up with, which I’ll schedule in the coming days and weeks. But that’s enough about me. I am with my family, and have just finished the preparations for tomorrow’s food. I have also managed to squeeze in some jam making. I haven’t had as much time this year as I normally would to make all the preserves ready for Christmas, so I haven’t made my own mincemeat. The mincemeat that I picked up on Saturday is at the more mediocre end of the spectrum, and I am not one to compromise on quality that much, so I thought that I would also share my tarted up mincemeat recipe. And of course, I wanted to wish you all a very merry Christmas, Great Yuletide, and a Happy Winter Solstice, whichever you celebrate. Soak the dried fruit in the port until the fruit is plump. This will take at least an hour. Stir in the mincemeat, and lemon zest, and allow to soak together with the fruit. If you are making your own pastry, make it now using the method here. Wrap it up and let it rest in the fridge for about an hour. 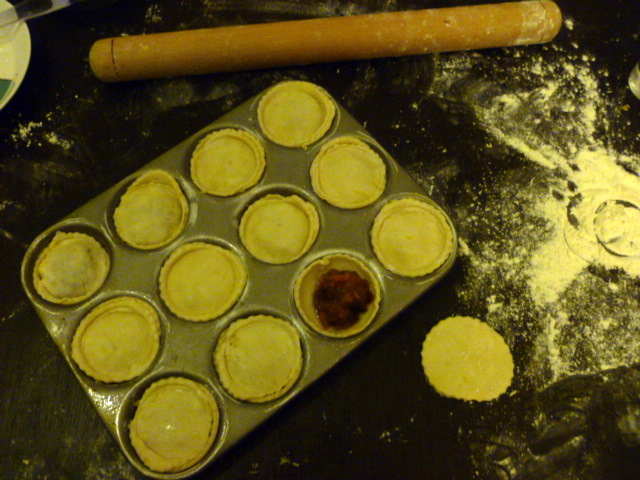 Add the chopped nuts to the mincemeat just before rolling out your pastry. 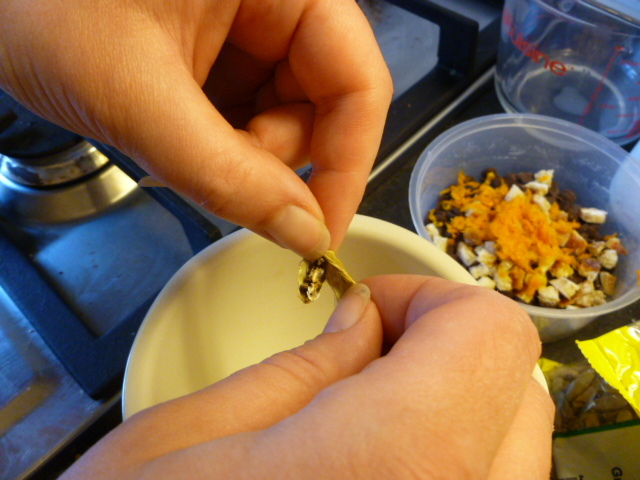 By using shop bought mincemeat, you are taking advantage of the pulped fruit (usually apple) and the spices. Normally mincemeat has to mature for at least a month before use, so this is a shortcut to tasty, fruity mincepies, without compromising on flavour. Roll out your pastry to about 3mm thick. Use two cutter sizes, one slightly larger for the base, cut an even number of bases and tops. Grease some tart tins. Cover with the bases, then press down gently with some dough offcuts. Add a heaped tsp of the mincemeat to each base. Brush the rim of one side of the top with milk or egg wash, cover the tart, wash side down, and either crimp or press gently with a shot glass to seal the pie. Brush the pies with more milk or egg wash. Put in the oven for about 15 minutes, or until they are golden brown. Serve them to your friends and guests and no-one will tell that you cheated a little bit. 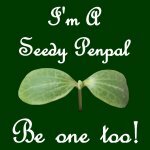 I was offered my first ever guest post recently by my friend who has had to pop back to her native Australia. I have been thinking of trying to recreate a chocolate bar that I fell in love with there, so I thought it would be a great opportunity to do so. Please go and have a look at her blog, she is funny and a great cook as well. Add to the fact that she was a quarter finalist in Masterchef, then you know that her food is worth checking out. She blogs at Average Baker. She is being modest, she is not at all average – in either cooking or in blogging. Anyway, it turns out that getting Cherry Ripes right, especially before the cherry season is upon us, is pretty difficult, and took me several attempts. 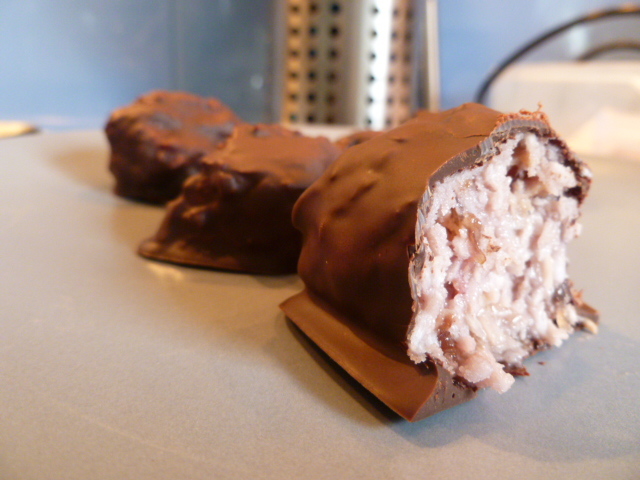 It would also not have been possible if it weren’t for Divalicious, who recently did a post on homemade “Bounty” bars, and this really helped me out with the right texture and taste for the bars. I have linked to Diva before, for the delicious aubergine, tomato and sumac salad that she does. In case you weren’t aware, she has changed her blog name to Divalicious Recipes in the City, so now she can be found here. I may have another go at these little bars, using real cherries and cherry compote, when I can get hold of them, but for now, this is my best attempt at Cherry Cripes, and you can read all about it here. Please do have a look, and let me know what you think. Yes, even my Aussie friends….! I have been searching around for ingredients for an Easter dinner for my friends. These are mostly the same friends who came for the International Christmas Dinner, so I wanted something that would encompass all of our traditions, as well as a nod to the Dutch. Some of these recipes will appear here in the coming days, as they are much less specific to Easter, but this one couldn’t be delayed. One of the traditions that I found out about was the Australian one. For friends from the Southern Hemisphere, Easter heralds the start of autumn, and thus is naturally a little less about rebirth and rejuvenation, even though they do continue to keep many of the same traditions as us in the North (hint: eggs and chocolate feature in all Easter traditions, as far as I can tell). According to this website, there are a few key differences. Anyone who has seen an episode of Border Security will know that Australians are none too keen on letting in non-native animals, due to the havoc that they wreak. It is no surprise then, that they have replaced the Easter Bunny with the much more native Bilby. However, my chocolate work needs a lot more practice, and it is certainly not up to making small chocolate marsupials without a mould. 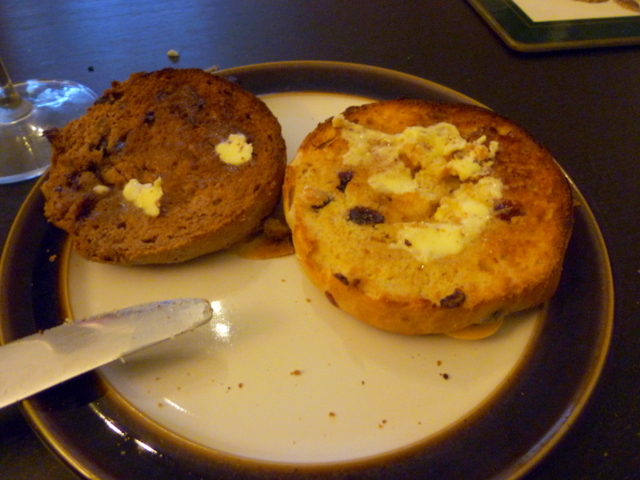 So, I was very happy when I saw the fact that the Aussies have taken the hot cross bun, and made their own version. With chocolate. 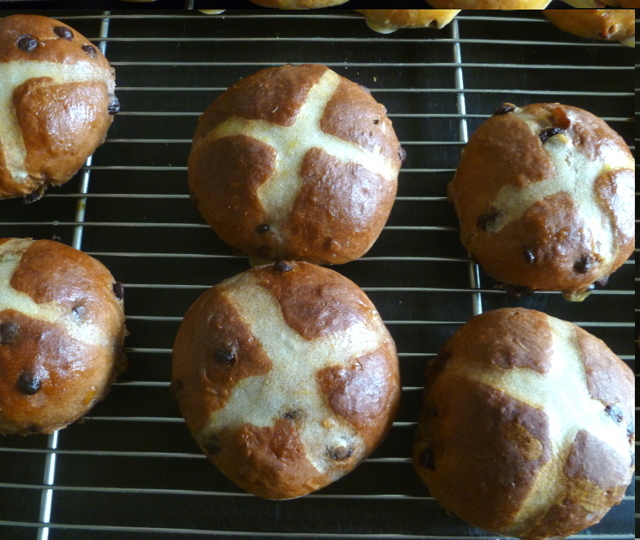 I had already decided to make traditional Hot Cross Buns for dessert. Strictly speaking, they are served on Good Friday, but as it is my tradition to break the rules for international dinners, I am going to serve them for Easter Sunday itself. And I get to do two kinds. 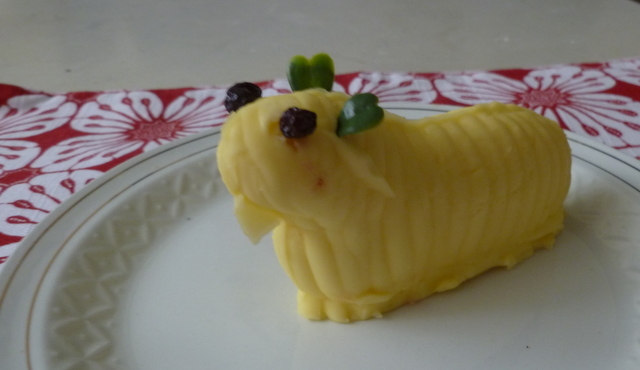 We will serve them toasted, to be smeared with butter moulded in the shape of a lamb, which is a Dutch tradition. I made the British buns using the recipe from the River Cottage Bread Book, by Daniel Stevens. Then, I adapted it to make what I am calling Southern Cross Buns, which I think are good for any occasion, and you can keep the cross, since they are named after the Australian flag. And I photographed the steps for you. You may remember that I made my own candied peel. This is not compulsory, but it does make it a lot easier to use only the orange peel for this recipe. If you have (or wish to make) your own candied peel, chop it finely before you start the rest of the steps. Also lightly crush the cardamom pods to release the black seeds inside, and grind these to a coarse powder with a pestle and mortar. I found that mixing boiling water from the kettle, and cold milk from the fridge, the resulting liquid was warm, but not too hot for the yeast. You can use a food mixer with a dough hook for this recipe, but I am gadget-averse, so I had to do it with my hands. whichever way you choose, the dough is fairly sticky. Pour the liquid into the well, and mix. Once it looks a bit like this, add the butter and the egg. This is when it gets sticky. 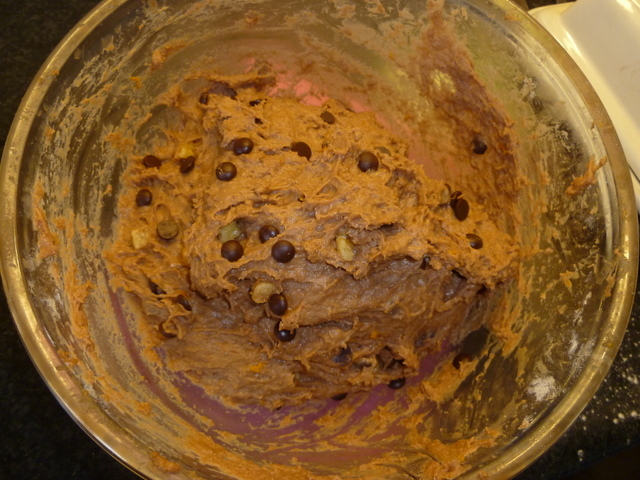 Mix it well, so that you cannot see lumps of butter in the mixture anymore. Then add the chocolate, candied peel and the ground cardamom. Knead this in well. Try and leave it somewhere warm. It should take about an hour. I left it a bit longer, because I was busy with getting a lamb cooked, and other things. It was fine, and still rose nicely. Knock back – by punching the air out of it. I got the proportions mostly right when I cut it. Only one was smaller than the rest. Make it easier on yourself by cutting the dough in half, roughly shaping each half into a thick sausage which you cut in half, then half again. It should be fine, if the sausage doesn’t taper too much. 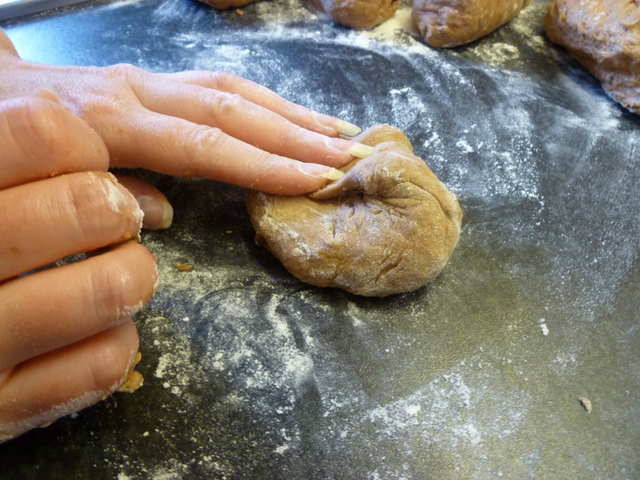 Shape each piece of dough into a round. The following steps are straight from the River Cottage book, but they work really well, so they are the steps you need. Put the flat side of the dough on a lightly floured counter. Each time that you do this, turn the dough a little, then repeat. 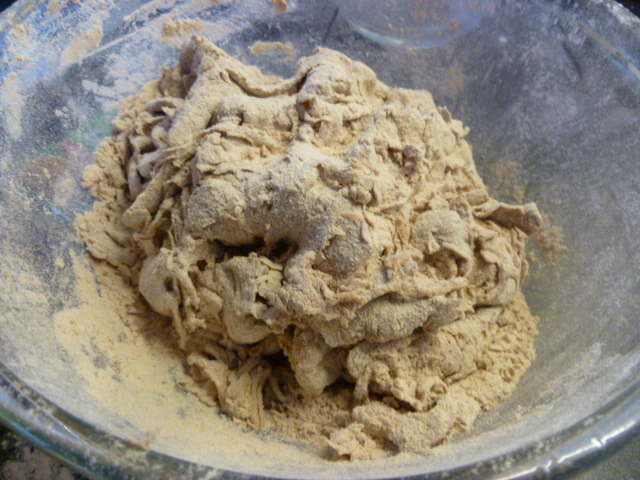 Do this until all the dough is folded into the middle, and press firmly. Flip it over onto the other side. If you are not that confident in working sticky dough, like me, then you will probably want to flour the work surface again a little bit. More confident bakers work focaccia, which is a much wetter dough, so you will probably be fine. 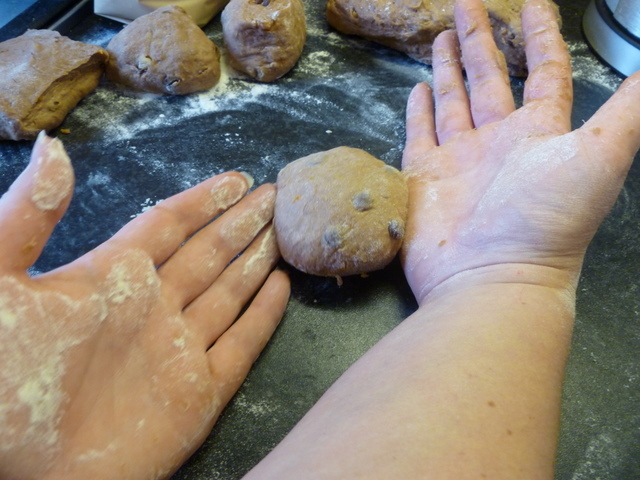 I found that I didn’t need to flour the buns later, because they were fine after I floured the surface. The next bit is difficult to describe. You need to stretch the top of the bun, while tightening the pinch at the bottom. To do this, you need to flatten your hands, place the heel of one hand against one side of the roll, and the fingers of your other hand on the other side. Next you need to move your hands in opposite directions, and bring them together under the bun, so that it spins. This will stretch the top of the dough. You will end up with your hands in the opposite configuration to that in which you started. Do this little move three times per bun. 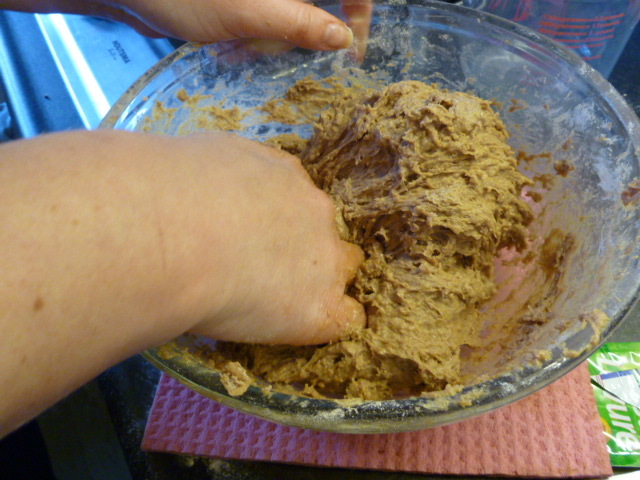 Then put it on a board, and dust it lightly with flour, if you didn’t do it on the work surface. 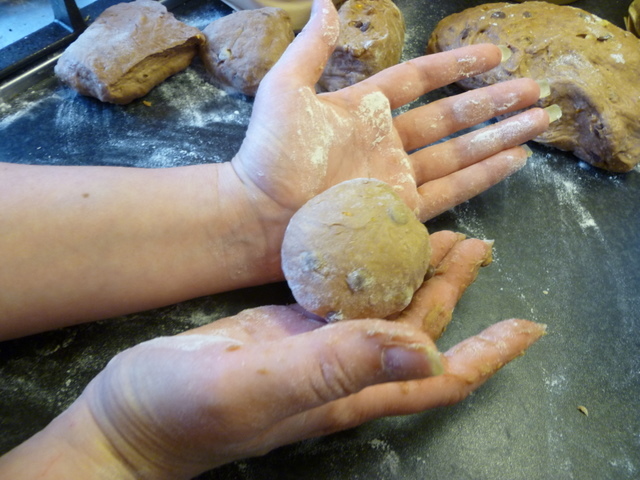 While the buns are proving, mix up the flour and water, with a whisk. This will form your cross. I think the paste needs to be fairly thick. If you get the thickness right, I don’t think you need the amount of flour I have given here. I think mine was too thin, because the contrast on the ordinary bun was not good enough, so I didn’t get a cross. The contrast between the chocolate buns was much better, due to their brown colour. However, for you I have upped the ratio of flour to water. 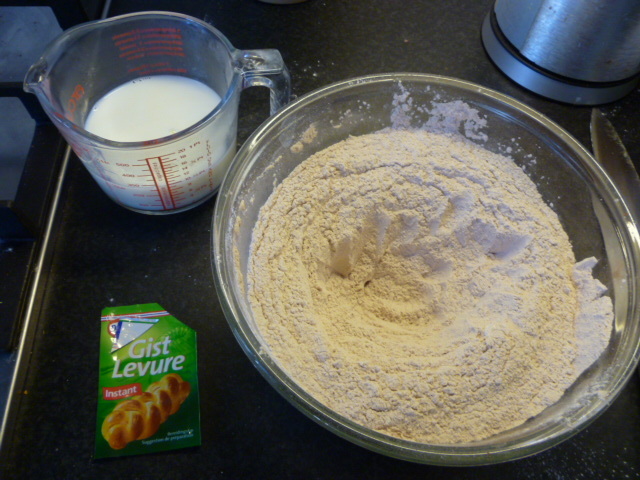 My advice would be to start with 50 g flour, and very slowly add the water, until you get a thick batter. it should leave ribbons when you pour it from a spoon, not run off. 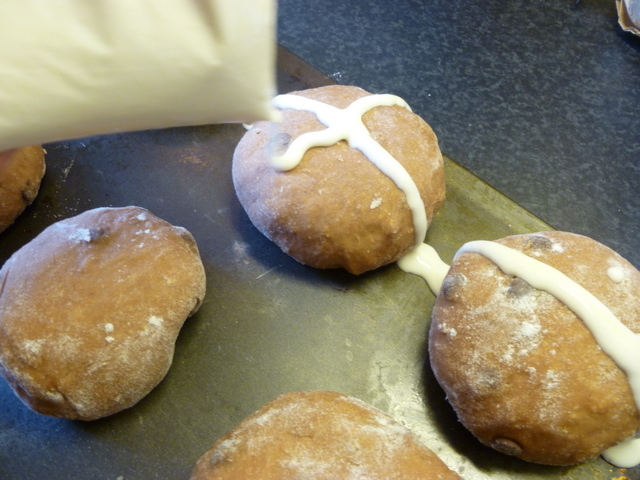 Once you have a good consistency for the paste, and the buns have proved, then you need to make the cross. Transfer the buns to a baking sheet. Put the flour paste into a sandwich bag (or piping bag, if you have all the fancy equipment) and snip off a really small corner – be careful, the piped line is much bigger than the hole appears. Pipe the paste over the bun in a straight line, then again, at right angles to the first. The piping bit is tricky, and needs a fairly steady hand. I have to admit to a few drips where there should be none. They wiped off easily enough, but I had a thin paste. It is best to be as careful as you can. Put the baking tray in the oven, and bake for between 15 and 25 minutes. Mine took nearer 25 minutes, so keep an eye on them. Like most bread-based products, they sound a little hollow when tapped on the bottom, when they are done. While the buns are in the oven, melt the apricot jam and the water to make a glaze. Glaze them by painting the jammy liquid over the top of each bun as they come out of the oven. Leave them to cool on a wire rack. Toasted is the correct way to serve these. Possibly slathered with butter from a wonky sheep. And so we finally come to the stars of the party, my mince pies. If they weren’t, I would have had to call it a Mulled Wine and Some Snacks Party,and to be quite honest, I’m not really sure it would have had the same draw. 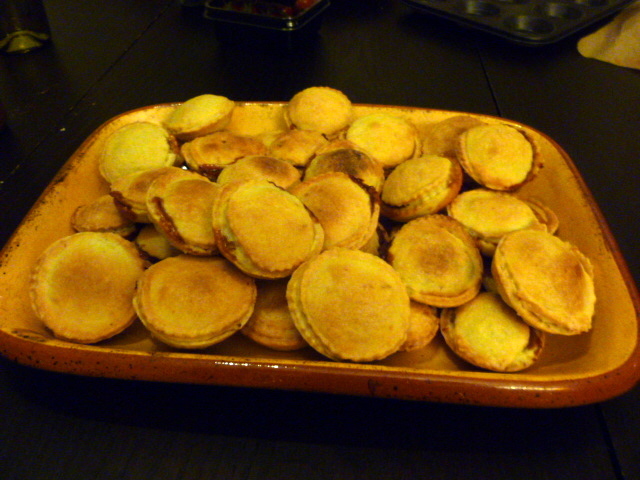 Mince Pies are a traditional British Christmas snack. My best friend refuses to eat them, due to an early childhood disappointment when he discovered that they did not contain mincemeat, but rather that they had fruits and spices inside. Originally, they actually did contain spiced meat, which was a way of disguising the fact that by the middle of winter, the meat was not at its freshest. They also contained some dried fruits. Mince pies have existed since about the 13th Century, when crusaders brought back the idea of mixing spice with meat from their trips to win the hearts and minds of the residents of the Middle East. They were considered symbolic of garish Catholic Idolatry by the professional miserablist Oliver Cromwell, but apparently it is quite difficult to come between us Brits and our little Christmas pies, so he was not successful in his attempts to ban them. Again, quite lucky for me and my themed parties. There is something to be said for the traditional ritual of baking these little treats that I find really restful, but exciting at the same time, as it heralds the start of my Christmas celebrations. I had made some Pear and Ginger Mincemeat back in September, which I got out. You can just use mincemeat to fill your pies, but I like to fiddle some more, for a more luxurious pie. To ordinary fruit mince, I would add nuts and port, and let them soak for a few hours. As this mince had ginger wine in, I let this one soak in a little brandy, although I did add more nuts, for some crunch. I had invited some people to the party that are vegan, and so I made up a batch of the Vegan Shortcrust Pastry. Some people prefer puff pastry in their mince pies, but I really think this is pastry overkill. Shortcrust is traditional, and for me it is the best way to get the right balance of pastry to filling. The best bit about making these pies is getting the right mix of the circles between base and lid, so as to maximise the number of them you can cut from a single roll of the pastry. Firstly, you need to get the right size of circle for your tins. I use muffin trays, because I like the added depth that you can get than with ordinary tart trays. Whichever you choose, you need to cut out 2 sizes of circles for the base and the lid. The base should be about 2 cm larger than the diameter of the “hole” in your tray – this is to allow the pastry to sink into the tray, and to come right up the side. The lid should be about the same diameter as the hole. If you are going to use pastry cutters, then choose the size down from the base. I have also used a variety of glasses, and find a wine glass and a shot glass is also fine to use. Roll out your pastry thinly. If you can 2-3 mm is ideal. Cut out the same number of base and lids. You will be likely to need to collect up the offcuts and re-roll these. If there is any left over, you can make a pasty with your mincemeat, or fill it with currants, a little sugar and some lemon zest and make an eccles cake. Grease the tart or muffin trays well using butter or olive oil, and put the oven on at 180°C. 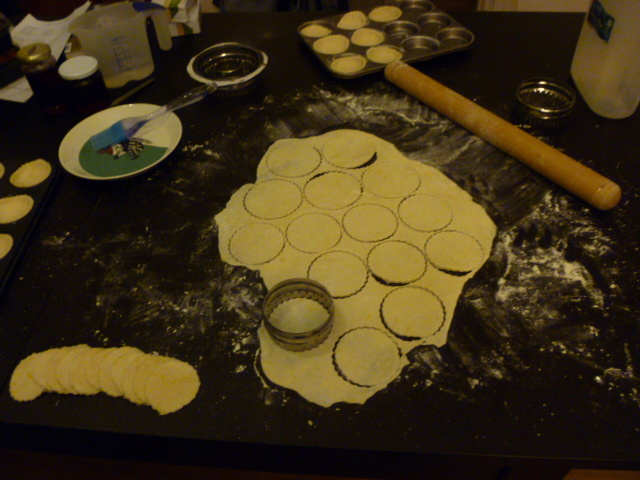 Then gently put the bases into the trays, and press down with a little offcut pastry. 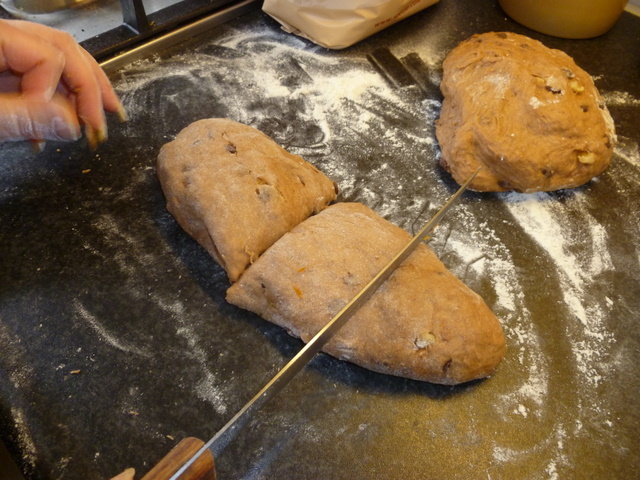 Add a heaped teaspoon of the mincemeat into each base. It needs to be generous, but not too full, otherwise your pie will burst in the oven. Take the lid, and brush round the rim of one side with a little water (if you are not making this for vegans, then you can use egg wash or milk). Place the lid, watered side down, over the pie. You will need to seal the pie, which I do by placing a glass that is slightly smaller than the diameter of the lid over the lid, and pressing it down to seal he base and the lid together. Brush with a little water and place into the oven for 20 minutes, or until the pastry is a golden brown. Serve the pies warm with a little icing sugar sprinkled over the top. You can make these in advance, and warm then through in a low oven before serving. Great on their own, or with cream. Best served with a glass of mulled wine! Waste Not Want Not Wednesdays: Bless Me Bloggers, For I Have Binned! ediblethings · Finding, Farming and Feasting on Food.